Scotland's first self-driving bus trial will run between Fife and Edinburgh next year. 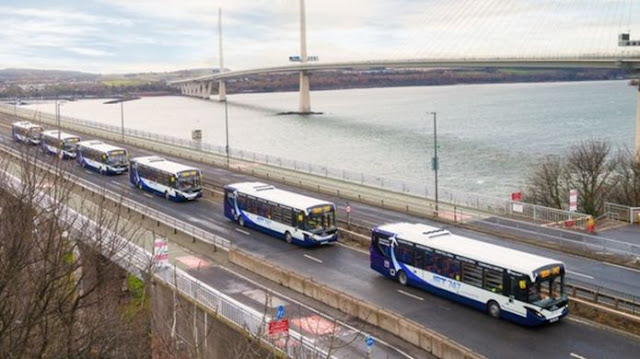 The pilot will include five autonomous single decker buses travelling across the Forth Road Bridge. A driver will still be required to be present on the bus during the trial as a back-up for passenger safety and to comply with UK legislation. Funding of £4.35m has been awarded by the UK government for the project, which aims to be operational in 2021. Additional funding has been provided by operators Stagecoach, Transport Scotland, bus manufacturer Alexander Dennis, Fusion Processing Ltd, and ESP Group. The bus will initially only be fully unmanned within its depot, carrying out movements including parking and moving to the fuelling station and bus wash. The autonomous buses will provide a service capable of carrying up to 42 passengers 14 miles across the Forth Bridge to Edinburgh Park train and tram interchange. Scotland's Transport Secretary Michael Matheson said: "This collaborative trial, using one of the country's most iconic transport corridors, shows Scotland is very much open for business in this innovative sector." UK Business Secretary Greg Clark said autonomous vehicles would "revolutionise the way we travel." He said: "The UK is building on its automotive heritage and strengths to develop the new vehicles and technologies and from 2021 the public will get to experience the future for themselves."